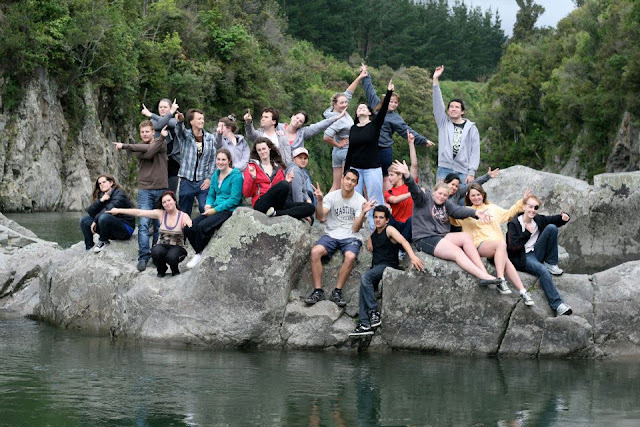 So the weekend just been , I spent with an amazing group of CanTeeners. These are the up and coming leaders of CanTeen , and I can't wait to see how they change things ! I'm so glad to have had the chance to meet these people . Each and every one of them is super supportive and ready to be there when someone needs them . Over the course of the weekend , we learnt about 'the fish philosophy' , thought seriously about our 'big rocks' and discussed values . The Fish Philosophy . Fish! Basically , play , be there , make their day and choose your attitude . Play : Make the work fun . In our case , fundraising . Because we're a non-profit organisation , we rely on the public for most of our funds . So during October , when we have our Bandanna Challenge , we need to make it fun . For us and the 'customers' . There's big rocks , and there's small rocks . In other words , goals . The small rocks are the stepping stones that lead up to the big rock . We went down to the river , and picked a rock each . 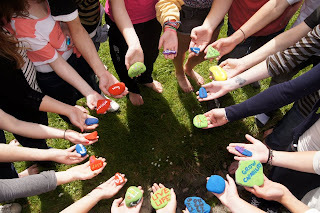 We then painted these rocks , first with a background colour , and then with a word/phrase . My word ? Nanny . To remind me everyday that that is what I'm leading up to in life , with every choice I make , I need to keep in mind that some things will affect the future . At CanTeen , we have 6 values . 'We also took heaps of photos , some pretty cool ones , other's not so cool haha .